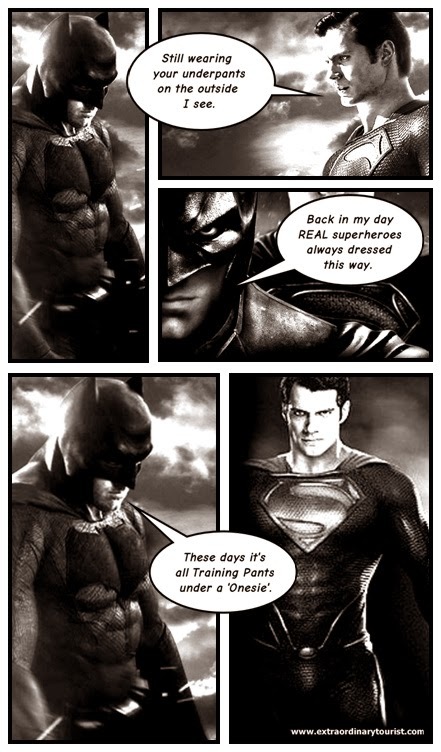 Like it or not, at least he isn't wearing training pants under a 'onesie' like 'L-Plate' Superman. Yeah... that's how my mind thinks. Thanks to various Batman v Superman fan artists whose images I used to create this bit of fun. Unfortunately your names are lost to me but your images have been on rotation on my computer desktop since not long after you put them online. If you would like to make your own comics like this then get yourself a copy of ComiPo - which is actually for creating your own Manga comics, even if you can't draw. This comic took me about an hour or so to make and most of that was deciding on my composition for each panel. Want to read more of my posts on Batman and Superman? Click the links below for a collection of posts about each. I'm a big fan of both and Superhero movies in general so have written many posts on the subjects. Or, if you just want to read my latest thoughts on the upcoming Batman v Superman movie read Ben Affleck's Batman Suit, Batmobile & Movie Title - My Thoughts.